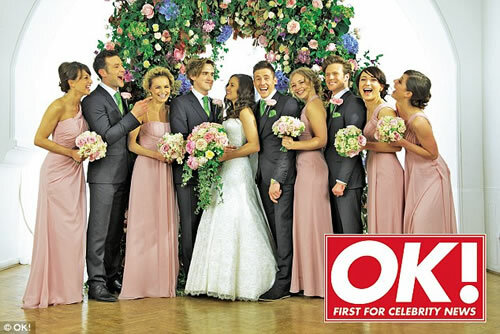 You are currently browsing articles tagged Celebrity Wedding Flowers. 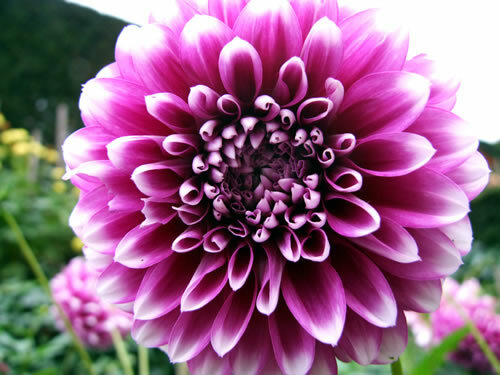 Dahlias were first discovered in Mexico in the 16th century and noted as a medicinal plant. They were brought to Madrid in 1789 and grown in the botanic garden. They are named after Swedish botanist Anders Dahl, and pronounced DAY-lee-a. Since 1813 commercial growers have bred dahlias and produced thousands of types, including pompoms, cactus and waterlily varieties. Dahlias are prized by gardeners for their magnificent flowers and often exhibited in horticultural shows and competitions. 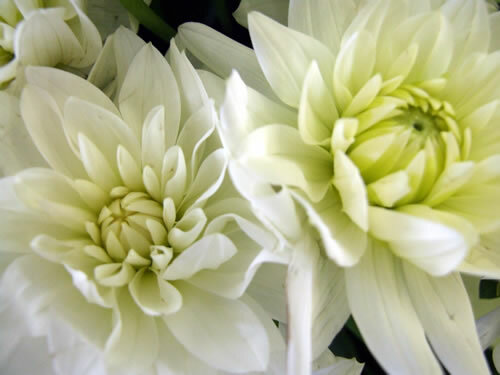 As Dahlias come from tropical regions they are not suited to temperatures below freezing. It is recommended to lift the tubers and store them over winter in a frost free place. The plants can range in height from 30cm for dwarf varieties up to 6m for the giant Tree dahlia. Some varieties produce flowers as large as a dinner plate. 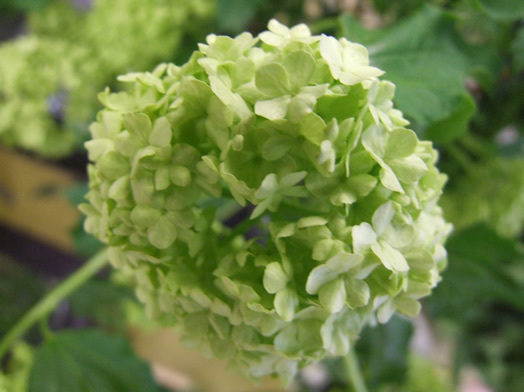 They are popular as a cut flower and available mainly from June to October. Dahlias come in many colours and lots of them are vibrant or two tone shades. They should be bought in a mature stage and handled with care as the open flowers are delicate. They have a vase life of up to a week. They are also available as a British grown flower in late summer. 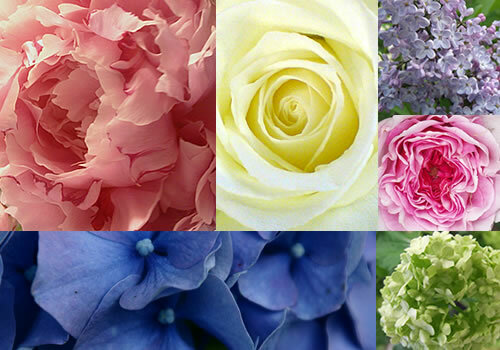 They are popular for weddings flowers as their peak season is through the summer. 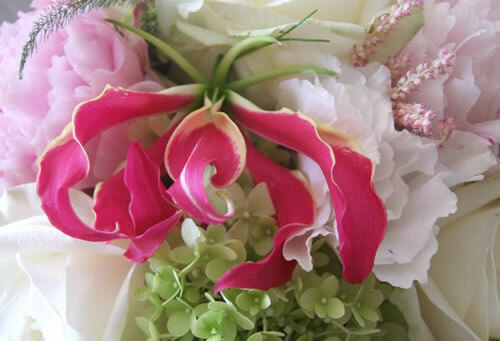 The perfectly uniform flowers look lovely used en masse in compact bridal bouquets or table arrangements. The British grown dahlias are often sold in bunches of gorgeous mixed jewel colours. 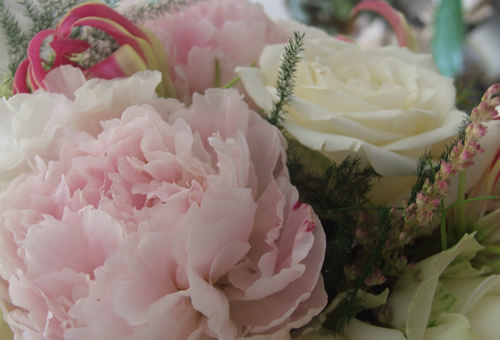 In the previous blog we had a quick look at the stunning flowers used for Edward and Bella’s wedding. The designer Tammy Polatsek went to town with the natural woodland theme . Thousands of flowers were using to make the wedding set, but don’t despair you can re-create the fabulous look without a big film budget. To help keep your flower costs sensible try to use ivory flowers that are in season when you get married. 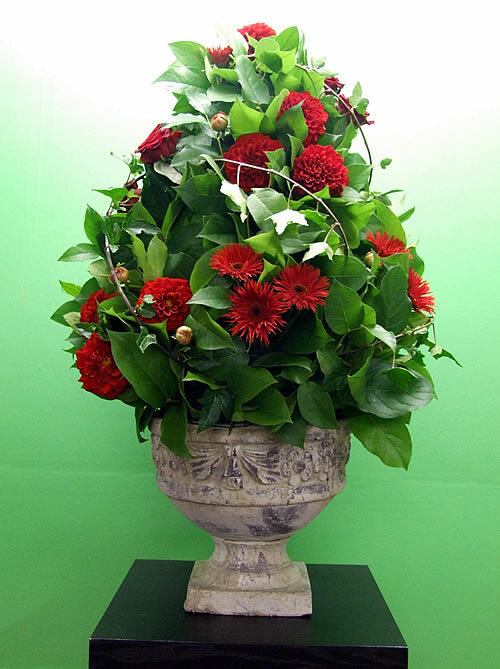 The flowers used in the film included roses, delphiniums, stocks, sweet peas, hyacinths, ranunculus, freesia, cherry blossom, wisteria and viburnum along with umbrella ferns, and lots of moss. 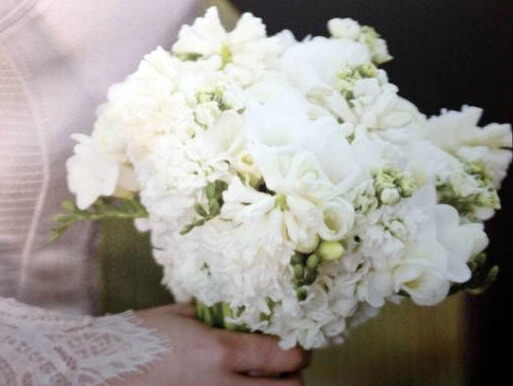 Bella carried a simple hand tied bouquet packed with beautiful ivory flowers. It must have smelt truly scrumptious, it contained hyacinths, freesia, stocks and ranunculus. 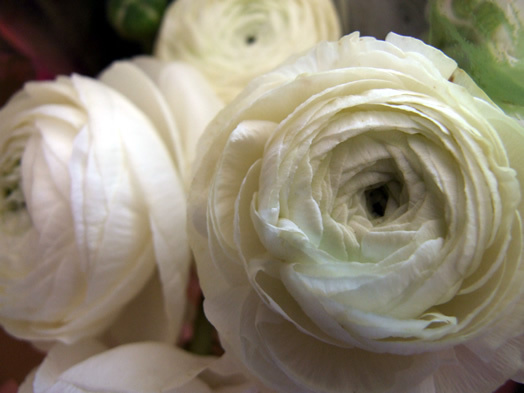 Freesia and ranunculus also make beautiful buttonholes with a couple of simple leaves. Although you can’t currently get married in a forest in the UK, you can get around this by having a legal ceremony in register office, and then having your ‘real’ big day with all your friends and family at a later date in your favourite woodland. Or you can of course bring the great outdoors inside. Create a woodland feel by lining your aisle with tall branches with mossed arrangements at the base and flowers arranged to look as if they are growing. 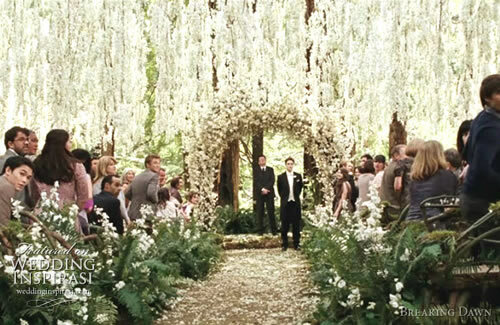 The floral arch in Breaking Dawn was breath taking; it was very tall and packed with flowers. It featured delphiniums, cherry blossom and other white flowers. The arch in the film was so full with flowers, it would be budget busting for most brides. A scaled down version could still feature lots of gorgeous flowers but with a bit more foliage and moss. Many florists will have an arch structure that they decorate and hire out for weddings. The reception tables had a very natural organic looking design on them, but they were quite tall and sprawling, so the plates and tableware were very close to the edge of the tables. Things can get knocked over when the table is that full and if your guests can’t see across the tables they may even move your lovely flowers elsewhere. I would opt for a design with the candelabra at the centre of the table and have the flowers around the base, arranged in a natural style with lots of moss and foliage. 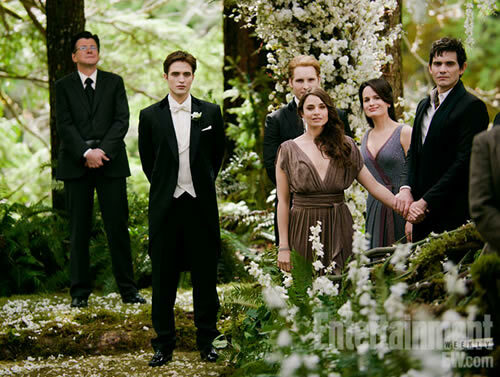 We’ve had a few glimpses of the amazing Twilight wedding scene. The trailers promised a magical woodland setting, but only showed the flowers for a split second. But the time has finally come, Breaking Dawn is released today. The lady behind the wedding set design and flowers is Tammy Polatsek. 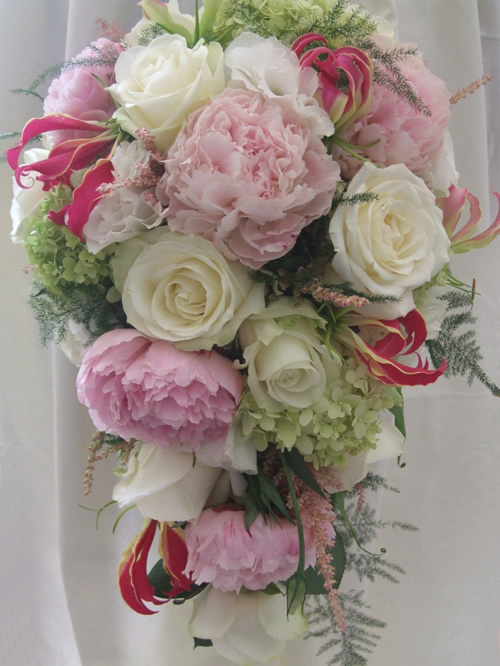 She was responsible for designing and sourcing all the flowers for the wedding and reception. She also designed a porcelain dinner set for the reception that was used in the film. The wedding had a Mid-summer nights dream feel to it, everything was very natural and earthy in a forest setting surrounded by lots of flowers, foliage and moss. The colour scheme for the flowers was white and ivory with lots of deep green ferns. The ceremony featured low woodland style arrangements lining the aisle and a stunning floral canopy. The canopy was made with thousands of white wisteria flowers made into 40-50 feet lengths. White lavender and cherry blossom also featured in the ceremony flowers. There were tree stumps dotted around the ceremony to complete the woodland theme, these were decorated with flowers so they appeared to be growing from the stumps. The aisle was strewn with white petals and at the end of the aisle there was a magnificent floral arch where Edward and Bella said their vows. It was covered in white flowers including delphiniums and cherry blossom. The reception tables were dressed with moss green table cloths with fabric leaves attached to them. The centrepieces were large natural designs with viburnum opulus, delphiniums, sweet peas, hyacinths, ranunculus, umbrella ferns and moss. 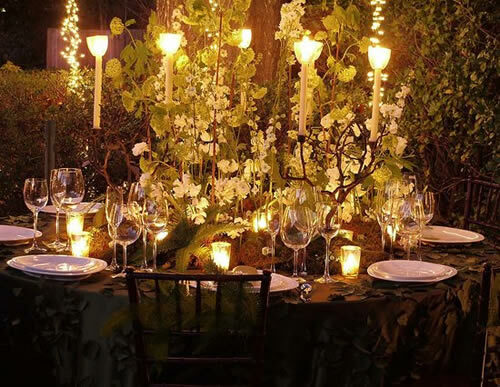 The centrepiece incorporated candelabras shaped like tree branches. Small candles were also dotted around the arrangement. 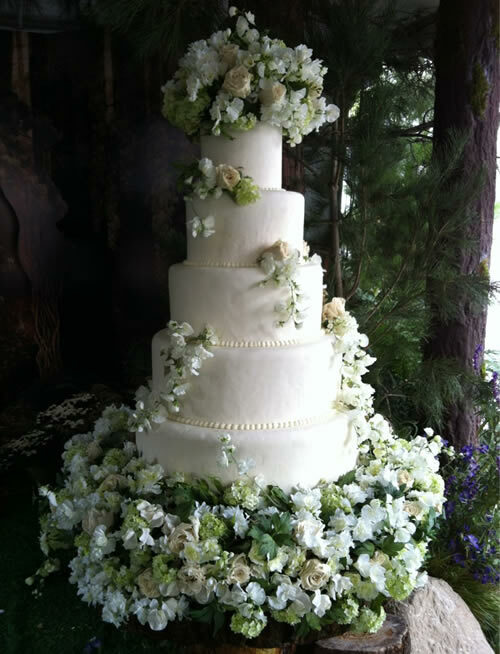 The wedding cake was a large five tier design, simply iced and decorated with ivory and white flowers. The floral ring surrounding the cake contained roses, viburnum, and sweet peas.